Better than its predecessor, but not good enough to fend off the competition. HD screen with great colour reproduction; Good camera; Long battery life. Done to death design; Not ideal for single-handed usage; Inconsistant performance; Gaudy user interface. 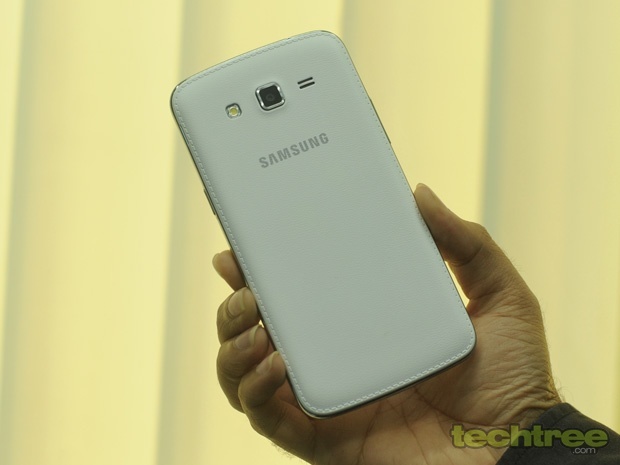 The Samsung GALAXY Grand was the top selling handset last year. Clearly, the GALAXY brand name and the large screen worked in its favour. Otherwise, those with even minute of knowledge about the smartphones avoided it like a plague. The phone’s screen was washed out and pixelated. Performance was disappointing, and it also lacked stability. 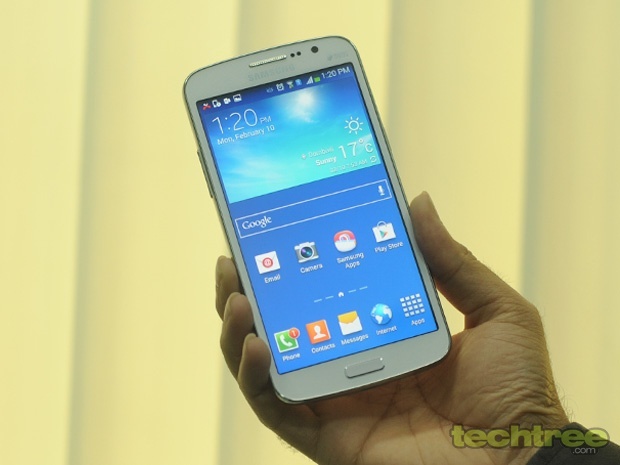 Despite that, the GALAXY Grand sold like hot-cakes and Samsung went laughing all the way to the bank. Now the Koreans are back with this phone’s successor — the GALAXY Grand 2. Is it a same story altogether or Samsung has taken efforts to addressed the issues to justify the Grand 2’s Rs 22,000 price tag? The Grand 2 looks similar to its predecessor. Actually, every other Samsung smartphone looks identical these days. The handset has rounded corners and faux-chrome finish on its sides. Looking at my colleague’s Grand, I can tell that it would lose colour in a few months. The only difference I could spot was the faux-leather texture on the Grand 2. It doesn’t help with the aesthetics, but at least provides a better grip compared to the original Grand’s glossy back-panel. Being a 5-incher, it’s too big for a comfortable single-handed usage. 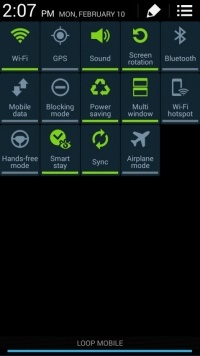 Samsung has retained the physical Home button, placed between the contextual Menu and Back key. Other buttons such as Volume Rocker and Lock button are easily accessible. In all, the handset has a done-to-death design. Neither it look premium, nor does it excel in terms of ergonomics. The only saving grace here is that the phone is sturdy. The phone's 5" capacitive screen has pixel dimensions of 1280x720. That’s a major improvement over the original Grand’s screen where you can easily single out pixels. Samsung still hasn’t used an IPS panel, but the screen’s colour reproduction great. The Grand 2 still lacks Gorilla Glass protection, so you better be extra careful not to mix it with keys in your pocket. Samsung has done nothing to enhance the screen’s sunlight legibility. The phone is powered by a Quad-core processor clocked at 1.2 GHz, and has 1.5 GB of RAM. To take care of your photography needs, there's an 8 megapixel autofocus camera with LED flash. Other features include 8 GB of internal storage, microSD card slot, Wi-Fi, Bluetooth 4.0, 3G connectivity, dual-SIM support, and 2600 mAh battery. The phone’s network reception was great. In-call voice was loud and clear too. 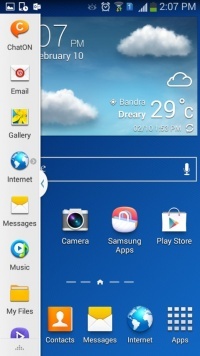 The GALAXY Grand 2 comes with Android 4.3 Jelly Bean. 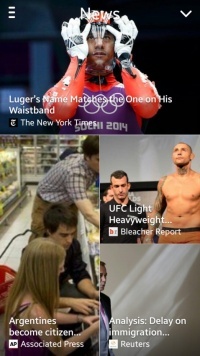 However, with Samsung’s TouchWiz layer on top, you won't find much of a difference in the UI. The design elements are gaudy as usual. The icons are big, and the phone makes annoying "bloop" sound every time you click something. The phone borrows a few features such as Multi Window from Note series. For those not in the know, this feature allows you to run two apps simultaneously in split-screen mode. 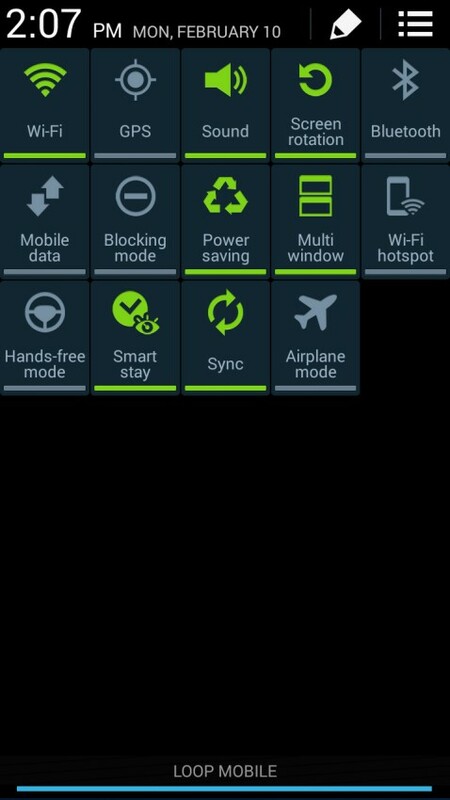 The notification panel offers the Wi-Fi, GPS, and Silent mode toggles. Moreover, the brightness slider has also been placed right there, which is a good call. However, the quick-settings menu is still extremely cluttered for my liking. A new addition here is 'My Magazine', which is complete rip off of HTC's Blink Feed. 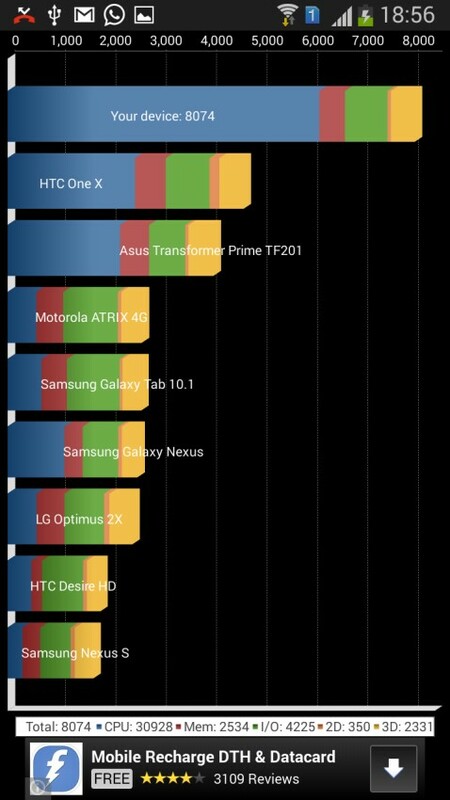 Performance wise, the phone runs smoothly most of the times. However, there's nothing to write home about its stability. The phone would stutter and lag out of the blue. Sometimes even the contact book takes 3-4 seconds to load. We did a factory reset, but that didn't help, so I guess it's the lack of software optimisation from Samsung. 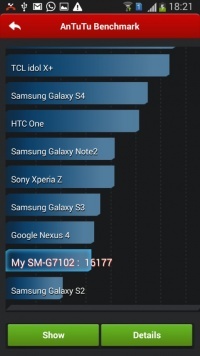 A user wouldn’t care about a quad-core processor, if its performance is not consistent. 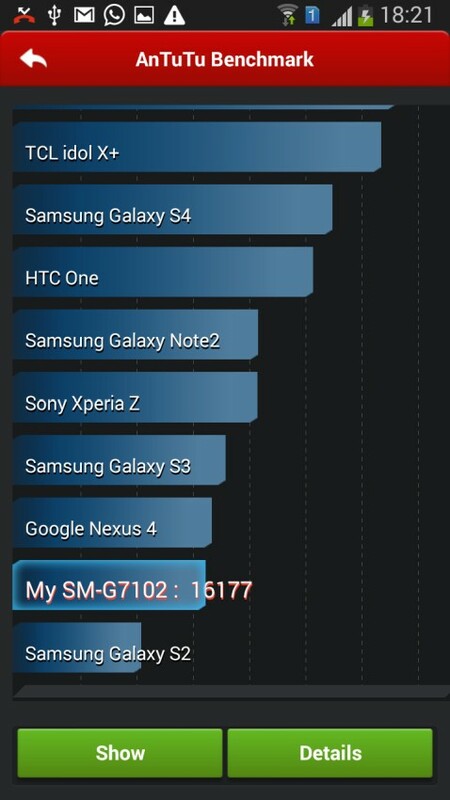 We ran popular synthetic benchmarks on the handset, and here are the results — AnTuTu 16177; Quadrant 8074. The phone sound quality is very good. The bundled earphones are good too. Samsung has thrown in plenty of audio settings. You get to play around with equalisers and virtual surround effects. Moving onto video playback, the phone can handle most 1080p files. It also supports subtitles out-of-the-box. The onboard 8 megapixel camera offers multiple options such as Beauty face, Best photo, Continuous shot, Sound & shot, HDR, Panorama, and Sports. Compared to most Android phones in this price bracket, the camera performs well job in well-lit conditions. The phone can record 1080p videos at 30 fps. The quality of the videos turn out to be good. The phone comes with 2600 mAh battery. With normal usage, the juice lasts easily over a day and half. 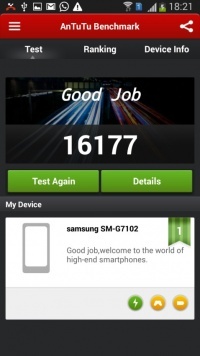 That's very good for Android handsets these days. 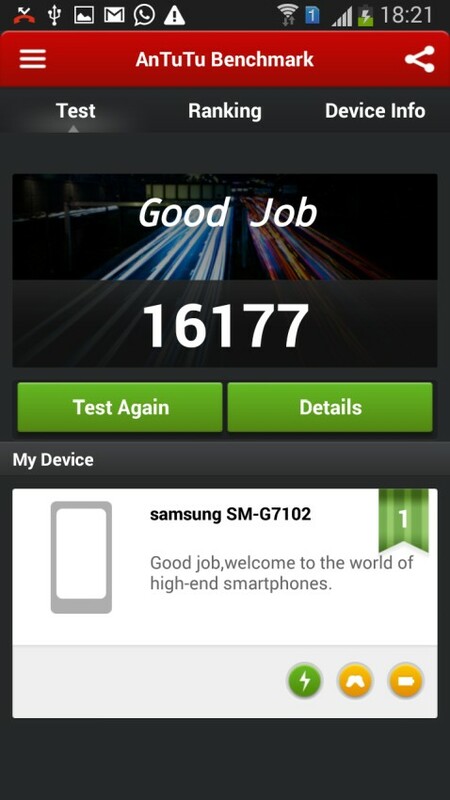 The GALAXY Grand 2 is a massive improvement over its predecessor. This handset has a good screen, camera, and battery life. However, priced at Rs 22,000, the phone’s performance is not consistent. Many will find its interface garish. The design is done-to-death and the handset doesn’t feel premium compared to the similarly priced phones. So if you’re planning to buy a phone in price bracket, the Lenovo Vibe X (Rs 23,000) and Nokia Lumia 920 (Rs 24,000) are definitely better options.